Combine fashion and function with Legz! leg cast covers. Your discreet, fun, solid, or bold cast cover will protect your leg cast, splint, or brace. Keep your cast clean while protecting clothes, furniture, toes, and skin from snags and scratches. Fashion leg cast covers for your splint, brace or cast! Make a FUNctional fashion statement with CastCoverz! Legz! Made of stretchy Lycra/spandex blends, CastCoverz! Legz! leg cast cover, also known as leg cast sock or toe foot cast cover, comes in 3 standard sizes (S, M, L) and two lengths (Long: Thigh High and Short: Just Below Knee). Please check our sizing chart to determine your size. Our Legz! stretch over most casts (check our sizing chart) and prevents the scratching and irritation of surrounding skin, other people, and the snagging of clothes, furniture, and upholstery that so often occurs when wearing a brace, cast or boot. Change the conversation from, "What happened to you?" to "How cool is that!?" with a large selection of 100+ fabrics. Please note: all leg cast covers are suitable for only non weight-bearing casts. Sorry, but no fabrics hold up when walked on. Hand or gentle wash, cold water. Low air or drip dry. Latex-free. Lycra/spandex blend. Do you need a waterproof leg cast cover for bathing or swimming? Check out your options here. Do you need weatherproof protection? Slickerz! will protect your cast from sand, snow and rain (NOT for immersion). If you're in a boot, please check out our Bootz! (our daily wear product), BootGuardz! (for rainy or sandy outings), or BootGuardzXtreme! (for cold, snowy weather). 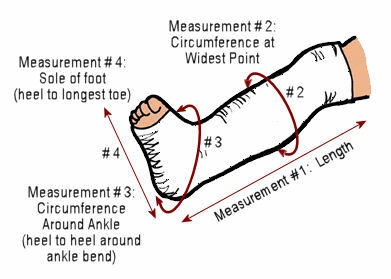 If you fall outside the measurements below, a custom Legz! is what you need. Simply contact us with your height and fabric selection(s) and we'll quote you a Custom Coverz! price and estimated time of arrival. For more information about our Custom Coverz!, click here. We're sorry, but custom products cannot be returned or exchanged. FUN FACT: CastCoverz! is the only company on the market that offers a closed toe design (and the only company that designates right or left foot, too) as our standard design. If you want an open toe design to show off that pedicure or to get some air, please select the open toe option. FYI: 97% of our Legz! sold are closed toe. Questions? Please give us a call at 1(800)CASTCOVER (1-800-227-8268) or email us at cs@castcoverz.com.